This Ring is jam packed with things to do if you want to explore. Moor up in the fabulous Gas street Basin in Birmingham near the Sea Life centre and Jewellery Quarter. Visit Drayton Manor Theme park & Tamworths Snowdome, Cadbury World and the Black Country Museum or just enjoy the lovely scenery of the Staffordshire & Worcestershire Canal, & visit the historic Shugborough Hall, home of the Earl of Lichfield. At Gailey Wharf look out for the large round toll keepers watch tower , there is now a canal shop selling gifts on the bottom floor. You soon reach the outskirts of Wolverhampton, and the junction of the Shopshire Union Canal with the Staffordshire and Worcester Canal at Autherley. It is 3 hours cruising to here. Continue on down the Staff & Worcs Canal as you will soon reach the Aldersley Junction where you turn left onto the Birmingham navigations. After the last lock there are useful water and refuse points. It is also not far into the centre of Wolverhampton. 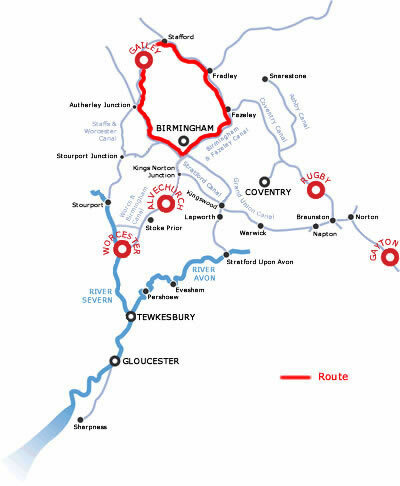 The cruise will take you to the Black Country Museum, right through Birmingham. It is 6 hours cruising to here, so if you set off early there is still plenty of time to explore the fantastic Outdoor living museum or do so tomorrow morning. There are moorings both sides of Owen Street bridge , and you can walk to the Museum. Turn right along the Wolverhampton level canal, it is lock free for a while now, ignore the right turning at Oldbury Junction, and turn right at the Spon Lane Junction. There are 3 locks at Smethwick, but after these it is lock free again and the canal joins the Birmingham main line at Smethwick Junction. 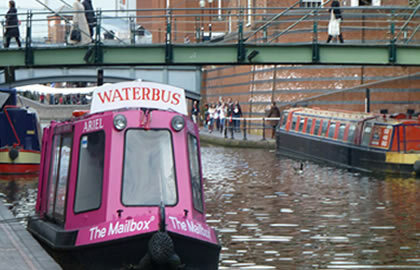 At Deep Cuttings Junction turn left on the Birmingham & Fazeley Canal & try & moor up near Cambrian Wharf. There are a huge number of shops and of course you cannot miss the jewellery quarter. Plus for the kids there is the Sealife centre opposite Cambrian Wharf. It is 4 hours cruising to here. Have a big breakfast because you have 12 locks at Farmers Bridge straight away, and 10 locks at Aston, all to do this morning! From this point the locks fall steeply away from the heart of Birmingham, you will soon encounter the Farmer's bridge flight of 12 locks, where you will need a BW anti vandal key. Moor up here for the night, it is 7.5 hours Cruising. In the evening it might be worth getting a Taxi into nearby Tamworth and visit the Snowdome, where you can ski, snowboard or toboggan on real snow. It is worth mooring near here, maybe before you get to the Fradley Junction if it is busy. The canal soon enters quiet countryside until it gets to the village of Handsacre. There is useful store 500 yards south of Bridge 59, and a fish and chip shop and a cafe near Bridge 58. The next village is Armitage and there is a very popular restaurant called Tom Cobleighs Spode Cottage, also the Plum Pudding Pub is canalside, and the Ash tree at bridge 62. Gailey Wharf and the end of your holiday is soon reached, the Wharf is the other side of the Lock after Gailey bridge.